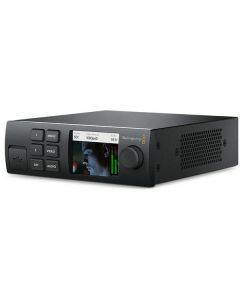 UltraStudio HD Mini features professional broadcast quality connections that include 3G-SDI, analog YUV and composite NTSC/PAL video inputs, along with a reference input. There are also two ¼” audio connections for analog audio input that work with balanced and HiFi sources. In addition, UltraStudio HD Mini can remote control professional broadcast decks using the built in RS-422 connection. For output, you get dual link 3G-SDI with fill and key, and an HDMI connection for monitoring video with a big screen television. Designed for portability, UltraStudio HD Mini fits in â…“ of a standard rack space so it can be racked alongside other equipment or used stand alone on the desktop. It’s also compatible with the optional Teranex Mini Smart Panel, which adds enhanced front panel controls and LCD monitoring so customers can preview video, see audio meters, timecode and more. Ultra Studio HD Mini is even small enough to fit in a backpack with a laptop and portable drive, making it the ultimate on-the-go capture and playback solution. SDI Video Inputs: 1 x 3Gb/s SD/HD switchable. SDI Video Outputs: 2 x 3Gb/s SD/HD switchable, supports single and dual link 4:2:2/4:4:4. HDMI Video Outputs: 1 x HDMI 1.4b type A connector. Analog Video Inputs: Y, B-Y, R-Y/NTSC/PAL. Analog Audio Inputs: 2 x 1/4 inch jack connectors for balanced and unbalanced analog audio. Analog Audio Outputs: None, embedded audio only. HDMI Audio Outputs: 2 Channels embedded in SD and HD. Software Included: Media Express, Disk Speed Test, LiveKey, Blackmagic Desktop Video Utility and Blackmagic driver on Mac OS X and Windows. Media Express, Blackmagic Desktop Video Utility and Blackmagic driver on Linux. Color Precision: 8, 10, 12-bit RGB 4:4:4 up to 1080p30 and 8, 10-bit YUV 4:2:2 in all standards. Multiple Rate support: SDI and HDMI video connections are switchable between standard definition and high definition. SDI switches between 270 Mb/s, 1.5 Gb/s and 3 Gb/s. Hardware Frame Buffer: v210 (10 bit YUV), 2vuy (8 bit YUV), ARGB, BGRA (8 bit RGB), r210 (10 bit RGB), R12B,R12L (12 bit RGB). Computer Capture: 1 x Thunderbolt™ 3 for Mac and Windows. Powers from Thunderbolt host computer, includes Blackmagic Desktop Video SDK. Built in Control Panel: None. Supports Teranex Mini Smart Panel with 2.2 inch color display for video preview, audio meters and status. Device Control: 1 x Sony™ compatible RS-422 deck control port. Serial ports TxRx direction reversible under software control. Physical Installation: Requires computer with a Thunderbolt™ 3 USB-C port. Please check support pages to see the full system requirements.